Graubünden is a top ski destination boasting 3 of Switzerland’s ski areas: Davos, Klosters, St. Moritz and the newly-linked Arosa-Lenzerheide, which offer a combined total of 850km of pistes. 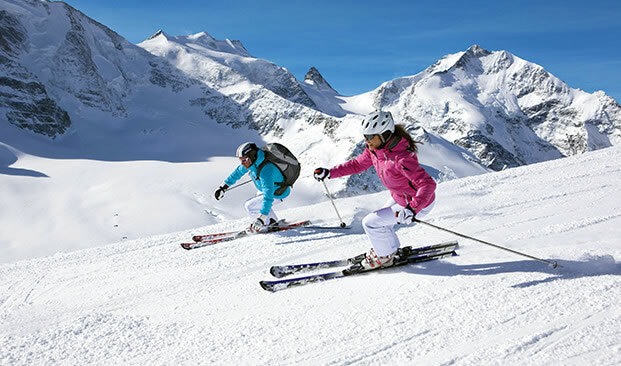 Ski and snowboard holidays here start at the airport, as the excellent Swiss rail network takes you efficiently and quickly from Zurich to resort, through some of Switzerland's most picturesque regions and typical ‘chocolate box’ Alpine scenery. Arosa is the latest exciting holiday option in this fantastic region. Newly linked with neighbouring Lenzerheide, this neat and compact resort now has a total of 225km of pistes on its doorstep. Arosa itself is a pretty mountain resort at the end of the beautifully forested Schanfigg Valley above the treeline and is surrounded by a spectacular series of high ridges. It is blessed with sunny days and an impressive snow record. Arosa is particularly good for beginners and families with fantastic nursery slopes in the village and free ski school available in selected hotels for children up to 17yrs inclusive. Advanced skiers need not fear: with the resort at 1800m and a ski area up to 2865m, there is plenty to explore. The ski area boasts a wide selection of varied red and blue runs, many of them wide and cruisy, but there are also some nice tree-lined areas, both in Arosa and Lenzerheide. Plus some challenging blacks, not to mention some great off-piste.